Happy leap year day, or February 29th. Leap years are such a weird calendar and solar phenomenon in my mind, and I am absolutely going to blame this catch up day for the bizarre weather that seems to be taking over this whole country. Within a week we are swinging between 35 and 65 degrees, and neither my ancient radiators or skin appreciate it. This refrigerator skin remedy is a fool proof way to calm and moisturize your skin. I have outrageously sensitive skin and have had nothing but positive results from this unusual concoction. Just keep your dog away, while harmless, Charlie tries to lick my face. 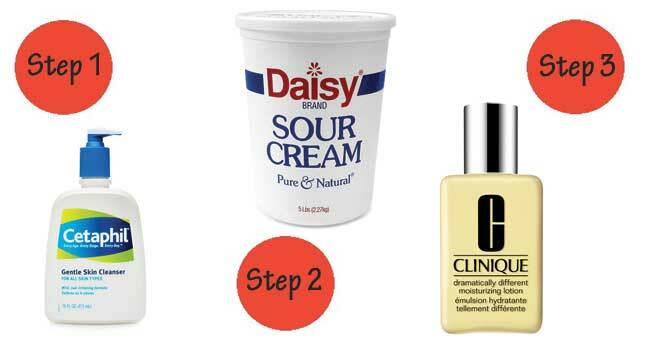 Step 1: Wash your face with your normal nightly cleanser. For me this is Proactiv, but use whatever works. Step 3: Rinse off the sour cream thoroughly and pat dry. My skin always feels unbelievably soft, smooth, and looks glowy without any redness or weather irritation. After a few minutes follow with your favorite moisturizer. This entry was posted in Beauty Closet. Bookmark the permalink. i use plain yogurt! i love this simple, yet effective mask! it feels so good and really helps to moisturize my dry skin. Cannot believe that sour cream works!! That is the oddest mask I’ve heard of! lol but definitely worth a short, my skin has been so dry lately. What a great trick! My poor skin is taking a bit of a beating this season. This is definitely interesting! We don’t have sour cream out here… there probably is but I just wouldn’t know what it’s called! I always like to use a load of olive oil for winter skin… and a honey and oat exfoliator.